• For quantitative determination of total protein. • Fast and sensitive. Assay takes 10 min. 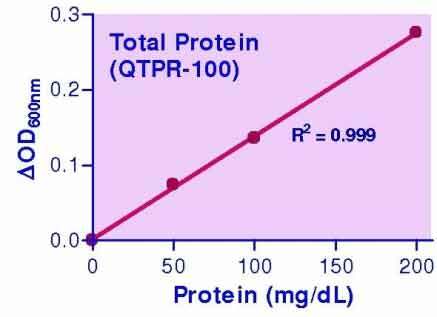 Linear detection range of 5 - 200 mg/dL protein. • Robust and Reliable. Substances in urine have minimal interference (< 2%). • Total protein concentration can be determined by several methods. However, protein dye-binding procedures are simple, reliable, rapid, readily automated and are becoming increasingly popular in assessing renal and blood brain barrier functions. BioAssay Systems Total Protein Assay Kit is based on an improved pyrogallol red-molybdate protein dye-binding assay. The color intensity at 600nm is directly proportional to the total protein concentration in the sample. This single reagent can be used for the quantitative determination of total protein in urine (proteinuria) and cerebrospinal fluid (blood brain barrier).